Chattel Mortgage vs. 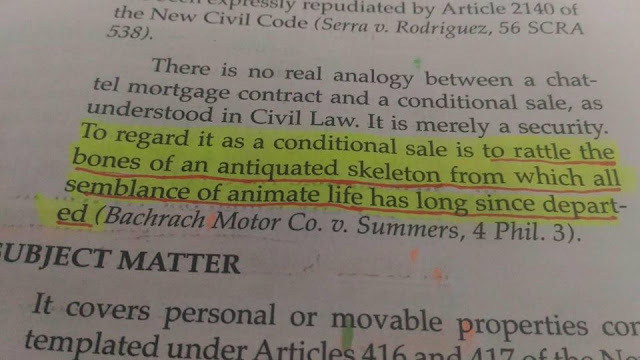 Conditional Sale; "Rattling the bones of an antiquated skeleton"
Now, while the proposition which we have here formulated contains a true description of the external features of the chattel mortgage, it does not by any means embody a correct statement of its judicial effects. A visit to any recorder's office in a common-law State will supply abundant proof that chattel mortgages are commonly drawn in the form of a straight sale, to which a clause of defeasance is added, declaring that in case the debt is paid or other obligation performed the contract will be void. But the form of the contract is merely a heritage from the remote past, and does not be any means reveal the exact import of the transaction. Every person, however superficially versed in American and English law, knows that in equity the mortgage, however drawn, is to be treated as a mere security. The contract in fact merely imposes on the mortgaged property a subsidiary obligation by which it is bound for the debt or other principal obligation of the mortgagor. This is the equitable conception of the mortgage; and ever since the English Court of Chancery attained to supremacy in this department of jurisprudence, mortgages have been dealt with in this sense in every land where English law has taken root. The old formulas may, it is true, remain, but a new spirit has been breathed into them. And of course sooner or later the ancient forms are discarded. Look, for instance, at the form of a chattel mortgage given in section 5 of Act No. 1508, where it is said that the mortgagor "conveys and mortgages." This means "conveys by way of mortgage;" and the word "mortgages" alone would of course be equally effective. In fact we note that in the contract executed in the present case, it is merely said that Elias Aboitiz "mortgages" the automobiles to which the contract relates. In describing the chattel mortgage as a conditional sale we are merely rattling the bones of an antiquated skeleton from which all semblance of animate life has long since departed. The author of Section 3 of the Chattel Mortgage Law was most unhappy in his effort to elucidate to civilian jurists the American conception of the contract of mortgage.